Sunshine manufactures the largest and boldest numbers in the industry. The LED Highrise grabs the attention of drivers and brings them off the road to your location. With digit sizes up to 114in, Sunshine makes it easy to catch your customers’ eyes. Billboards capture the attention of 75% of highway travelers, with more than half retaining what they read. 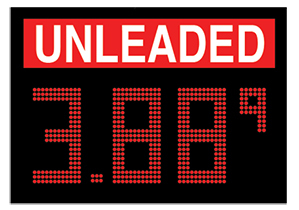 A billboard equipped with Sunshine’s striking and easy to read LED pricers will pull drivers to the pump. Help round out your brand and draw more traffic to your site. Sunshine LED canopy pricers turn a prominent structure into an advertising opportunity. Low profile cabinets protrude just 6in. off of the fascia, providing a crisp yet image harmonious display. Attract motorists to your store with Sunshine’s LED street sign pricers in prime on-premise placement. LED Streetsign pricers can mount to pole or monument structures, and are available in full new or retrofit cabinets, making them truly versatile displays. Enhance your ground-game with a pricer so crisp & clean it actually improves the landscape. If your store wore a name-tag this would be it. Make first impressions count by putting a bold Sunshine LED pricer to work under your most prominent on-site signage. Be in the right place all the time. Keep your customers’ eyes where you want them. 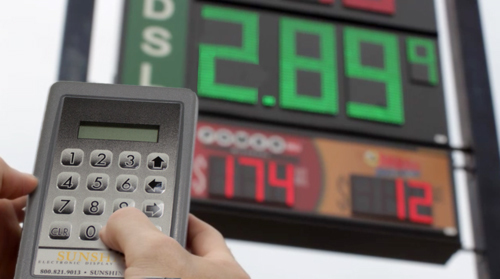 Available in custom product configurations, Sunshine's LED PumpToppers can be POS interfaced to update with your street signs and other displays, maximizing price exposure without increasing your workload. Sunshine retrofit displays are the perfect solution for updating your store’s appearance. Available in several build types and custom built for your current structure, Sunshine’s LED retrofit kit makes going from manual to electronic a snap. Give your price sign the facelift it needs. Power is nothing without control, let us put it in your hands. We believe in using the right tool for the job - offering a full array of control options for our LED pricers, from on-site wireless remote and POS interface, to our corporate level Skylink system. 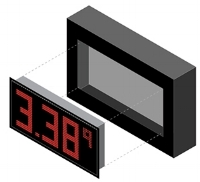 TallDigit displays are a field-proven, mechanical alternative to LED digits with more than 25 years of service in the industry. TallDigits are the go to option for high-rises & billboards when LEDs are prohibited. And, TallDigits are remotely & wirelessly updated using the same proven controls as our LEDs. Old school does not mean outdated.